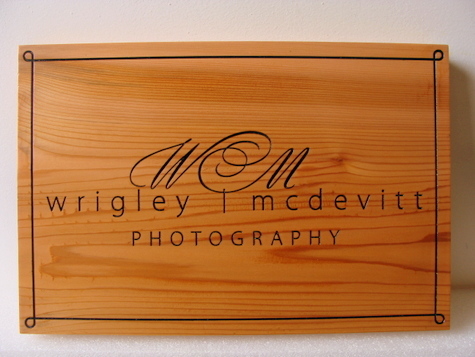 Above is a carved Cedar sign for a photographic studio. The sign, made of cedar wood or redwood, may be placed in an indoor or outdoor location. (Walnut, cherry and mahogany can be used for indoor signs.) The text, logo (initials of owners) and borders are engraved into the wood. The entire sign is then clear-coated twice for durability and UV protection.